The first time I came across Beethoven's death mask I was so struck by the brutal beauty, and fullness of feature, that I had to capture the same intensity in my own work. 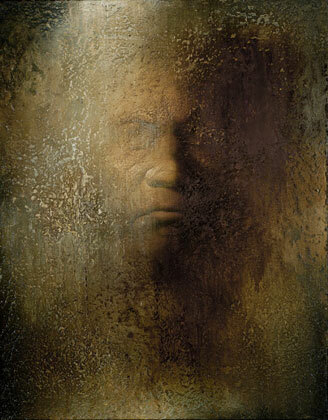 Being both of classically trained composer and painter, the death mask of Beethoven has obvious appeal for me. 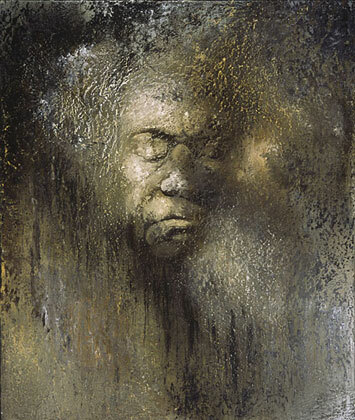 In this series of paintings, as in the composer's own music, entitled "The Beethoven Death Mask Variations," I have tried to create a tumultuous symphony of contrasting themes. The canvas becomes a battlefield of peaks and valleys, light and darkness, warms and cools, solidity and dissolution, representation and abstraction, life and death. To achieve more of a transcendental quality in painting I chose a medium that would not appear as painting but a phenomenon of nature. The strength and flexibility of acrylic emulsions allows me to create rough topographical textures not achievable with traditional mediums. The use of abrasive filters such as volcanic rock, marble dust, ash and other archival mortars help give the paintings a stone-like feel. The craggy stone effects, coupled with the enormous size of these canvases and emphasis on form, place the work somewhere between sculpture and painting. This quality is also enhanced by the subtractive process of sanding and scraping. 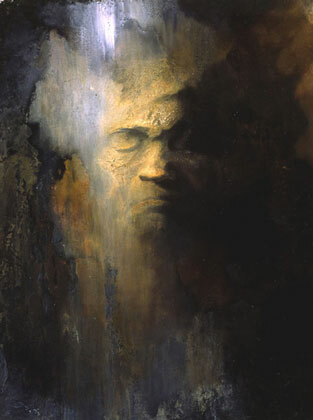 With knives, razors, steel wool, sandpaper and solvents, I reveal the previous layers of the painting like an archeologist reveals the buried secrets of the earth.Although "The Beethoven Death Mask Variations" seem to have a heavy emphasis on death and decay, they are really proclamations of renewal and endurance. As tortured and distressed as the features appear to be, Beethoven still emerges from the debris as solid and stone-like as the Egyptian Sphinx.